While Brazil isn’t the most expensive South America destination, it tends to run on the mid-range side for budget backpackers. Taxis from the Galeao Airport to Ipanema or Copacabana can range from $15-20. For the budget conscious, there are cheaper options using a bus or metro/bus combo. 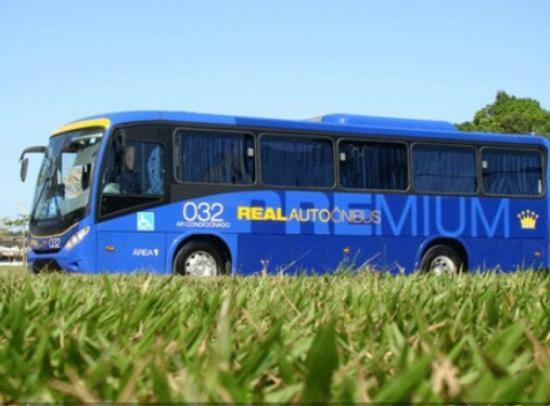 Throughout Ipanema and Copacabana, you’ll see the blue REAL buses driving through the city streets picking up passengers. It is one of the cheapest options available to get to the airport from Ipanema and Copacabana. It runs along Avenida Atlantica in Copacabana and Avenida Vieira Souto in Ipanema (the ocean-front roads). Flagging down the bus is a bit tricky - you’ll need to ensure it says Aeroporto on the front, but there are no official bus stops. Just make sure to stand at traffic stops and wave it down - it will stop for you. If you’re interested in a map of the bus line, a kind soul from the Internet drew this up → http://www.dsiaero.com/realbusrio/. If a bus is too stressful for you, this option might be more palatable. Take the metro to Botafogo station where you transfer to the Vincente de Carvalho station, and then take the BRT bus to GIG. You can buy a single ticket at any metro station to use on both the metro and the BRT bus. The metro is incredibly easy to figure out.